People in the field of regenerative medicine have some big challenges ahead, and they’re not quite the challenges you’d expect. Many advocates of Regenerative Medicine (RM) have suggested that many efforts to translate laboratory research discoveries into medical treatments may fail because of unique obstacles that face RM technologies. John Gardner and colleagues from the Universities of York and Sussex give their perspective on this in the journal Regenerative Medicine, outlining the challenges of taking RM technologies from ‘bench to bedside’ and discuss which challenges are unique, which are not and what is being done to address both. 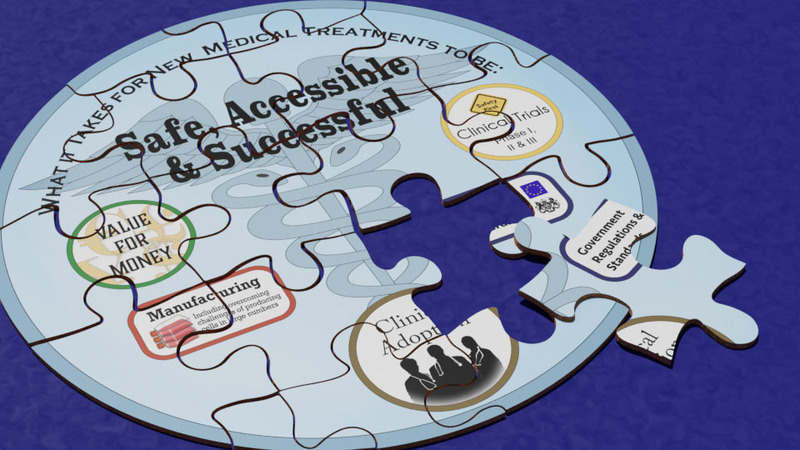 Generally the challenges fall into five categories: clinical trials (testing treatments), meeting government regulations, manufacturing/production, value-for-money and clinical adoption. Importantly, Gardner and colleagues discuss several previous medical advances, why they were successful or unsuccessful and what the field of RM might learn from them. What insights did the review present? A clinical trial is a rigorous three-step process that identifies if new drugs and medical devices are safe and effective. Many details about new medical treatments (e.g. drug dosage, side effects and demonstrating the intended function) are examined and must meet specific standards. However, applying these standards to RMs is often difficult and not really suitable. That’s because RMs often use living cells to replace dysfunctional cells in the body. There are many ways treatments using cells are unlike drugs and medical devices. First of all, many RM treatments - but not all - will permanently implant living cells into the body, whereas drugs and medical devices get metabolised or can be easily removed. Additionally, there are complications and questions about how cells used in treatments will be monitored; here are a few examples. How will cells be identified or traced in the body? What exactly are cells doing after a treatment is given? What properties of cells should be measured to determine if they are safe and effective? What costs and facilities would be involved with monitoring cells post-treatment? RMs that replace damaged cells can be incredibly powerful, with potential to cure patients completely. However, using living cells also carries big risks. If cells do not behave as expected a treatment could fail or seriously harm a patient (e.g. causing cancer). Cells used in RMs require very specific growth conditions and require people with technical experience to maintain them. There is a risk that people administering a clinical trial could slightly change cell conditions without realising it, making a RM treatment less effective, potentially unsafe and fail to meet trial standards. It’s also important to note that all cells have a natural amount of variation. But how much variation should be allowed? Standards for monitoring cells need to be established and ensuring that these standards are relevant can be a difficult process. Presently there are no answers to these problems, but people and governing bodies are reconsidering clinical trial standards for RM treatments and how trials should be carried out. In addition to meeting clinical trial standards, the development of medical treatments must also follow government regulations. RM treatments often contain qualities that fall under the jurisdiction of several different regulation bodies, making it difficult to know what regulations a new treatment must abide by. Furthermore, RM treatments may fall under different rules and regulations depending on the country they are brought to. For example, even though the EU has regulations for Advanced Therapy Medicinal Products (ATMP), the general regulatory framework can be difficult to interpret in relation to specific RM treatments. This leaves it up to individual countries to interpret rules. This kind of regulation ambiguity creates uncertainty and overwhelms investigators and manufacturers. The UK has responded to this by having two government agencies (MHRA and HTA) establish a ‘one-stop-shop’ that provides RM regulatory advice. In the EU, the European Medicines Agency had originally created the ‘Committee for Advanced Therapies’ to centralise approval of new advanced medical treatments. Upon seeing the need for clarification, this committee started offering to help classify new RM treatments as an additional service. Every discovery has its own challenges when becoming an applied technology. RMs are no different, but because RM treatments involve living cells, there are some very unique complications. The sensitivity of stem cells to growth conditions requires technical facilities and highly skilled individuals that are not readily available in most clinical settings. This could be a serious problem for accessibility and production if treatments require cells to be produced or maintained on-site before use. If cells are not produced on-site, methods for rapidly transporting living cells for immediate use will be needed. Additionally, RM treatments may require large amounts of cells when scaling up to treat people, but methods to produce these numbers of cells are still under development. Lastly, quality assurance guidelines need to be addressed for RMs using cells so that all treatments are standardised, a challenge when all cells have some natural variability. These production challenges are just a few that are more specific to RMs. Just because there is new medical treatment doesn’t mean it will be supplied to the public. Health Technology Assessment (HTA) agencies around the world evaluate new medical treatments for insurance companies and governments. They assess if new treatments are worth the price based on a treatment’s success rates, safety, long-term health effects, effectiveness (compared to current treatments), patient quality of life, long-term cost, upfront costs, and more. In the United Kingdom, NICE (National Institute for Health and Care Excellence) is the HTA agency for the National Health Service (NHS). Generally, NICE decides what medical treatments are offered by the NHS, and which are not. If an HTA agency approves a new technology, it still doesn’t mean that it will be widely adopted by clinical practitioners. Gardner and colleagues point out that new methods, treatments and procedures acquire an ‘adoption space’ that depends on how the technology fits into social-political contexts, working environments, professional interests, institutional benefits, and accessibility. To put it simply, technologies develop a ‘reputation’ based on their appearance, how they actually work and what benefits they offer. The success of new technologies often relies on a positive reputation and a good adoption space. Just because a new technology could greatly help patients and save insurance agencies money doesn’t mean it will be adopted. The NHS tried to introduce a new and very inexpensive technology that could rapidly identify cancerous cells in brest lymph nodes during a mastectomy (the removal of breasts, often because of cancer) so they could be immediately removed and avoid subsequent surgeries. However, reducing the number of surgeries meant that Trusts (NHS corporations) providing the secondary services would earn less money. As a result, the Trusts did not adopt the technology. A very different case study showed how some Trusts heavily invested into new surgical robotic technologies (around £1.5 million, with additional yearly operating costs of £100,000) simply to make a hospital or institution look technologically advanced. This was done even though equivalent and much cheaper standard surgical methods were already available. A final case study shows how ‘top-down’ implementation of E-health patient recording system by the NHS was ultimately rejected and abandoned. Although the system would improve recording and sharing of patient information, in addition to reducing hospital paper waste and record redundancy, the way it was rolled out didn’t integrate well with workers needs. Workers found it cumbersome, time consuming and less efficient than the old paper system, so they didn’t use it. Since then, a ‘middle-out’ implementation approach of the E-health system has been much more successful because it is working with staff to meet their needs. The good news is that people working to develop new RMs can learn a lot from how previous medical treatments were developed and integrated into medical practices. Understanding what makes medical advancements successful or unsuccessful can guide how to best introduce RMs to clinicians, medical institutions and the public. Previous examples show that even when new treatments have wonderful benefits, it doesn’t mean that they are always implemented. The reality is that new methods and treatments will only be successful if all the people and parties involved view them as advantageous. Luckily, RMs have a unique quality that makes them much more valuable than most medicines of today; RMs potentially will cure diseases rather than simply treating disease symptoms. It’s this curative nature of RMs that makes researchers, clinicians and patients all extremely excited that RMs could revolutionise the future of medicine. Presently, there are still many technical obstacles to overcome before RM treatments will become widespread and approved for use, particularly for more complex diseases. However, there are already several approved RM techniques and many more are in clinical trials. Scientific progress is being made, but successfully bringing a discovery into clinical use relies on more than science. Progress is also needed in how RMs are regulated, manufactured and clinically implemented. Thankfully, headway is being made that promises a bright future for RMs. This summary is based on the original article ‘Are there specific translational challenges in regenerative medicine? Lessons from other fields’ by John Gardnes, Alex Faulner, Aurélie Mahalatchimy and Andrew Webster, Regnerative Medicine 2015. A journal subscription may be required for access. If you are interested in knowing more about key factors affecting the progress of RM therapies, take are looks at REGenableMED, a project funded by ESRC that covers topics of manufacturing and reimbursment. This article on Good Manugacturing Practice (GMP) discusses more about the standards in place for making RM therapeutics. Not everyone tries to get stem cell treatments clinically approved. Eurostemcell has a series of articles that discuss this important topic, highlighting the issues, risks and safety concerns of unproven stem cell therapies. All European clinical trials can be found at the EU Clinical Trials Register, clinical trials looking for certification by the US FDA (US Food and Drug Administration) can be found at ClinicalTrials.gov. Many other clinical trials can be found on the WHO International Clinical Trials Registry Platform (ICTRP). Written by Dr. Ryan Lewis, edited by Dr. Jan Barfoot, reviewed by John Gardner.